Many small to medium-sized companies today leverage a Managed Services Partner (MSP) for IT services to avoid the cost of having IT administrators and support on staff. While this is a cost-effective solution for general IT support, MSP’s primarily address projects and day-to-day issues, otherwise known as “break-fix”. For the most part, MSP’s do not take steps to consult with their client to drive long-term IT strategy based on the business’s direction and growth goals—and business leaders often do not have the time or expertise to effectively drive IT. What’s a Virtual CIO (vCIO)—and What Does It Do? being a trusted business partner. By outsourcing CIO-level resources in absence of a formal CIO or CTO, business leaders are enabled to run the business and not be caught up in the day-to-day complex management of IT. 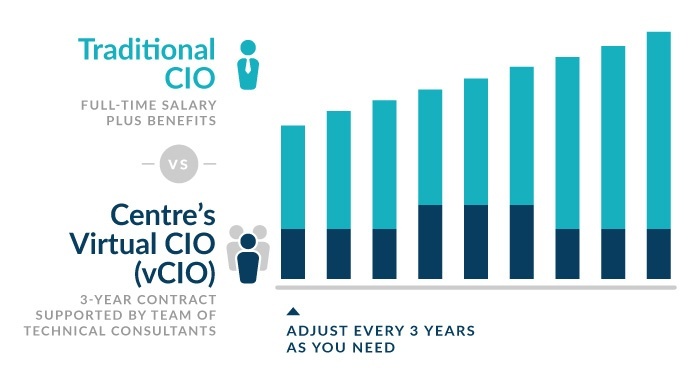 The vCIO can be brought in for a fraction of the salary requirements of hiring a full time CIO. Currently in the Texas market, the median cost of a CIO’s annual salary is roughly $170,000. For most SMBs, this is a salary that is difficult to justify when it comes to utilization and keeping the CIO busy for 40 hours a week. In comparison, it can be easier to justify and budget for a person with a set number of hours per month. Evaluating the set number of hours each year adds a level of flexibility and agility that supports evolving businesses. For example, the annual cost of a vCIO through Centre Technologies at 40 hours each month could save you upwards of 80% per year—and that’s not including the additional associated expenses of employment benefits for a full-time employee. But the benefits of a vCIO don’t stop there. Unlike a traditional full-time CIO, the cost of Centre vCIOs includes the backing of a skillful team of technology consultants with decades of IT experience. Furthermore, assigned Centre vCIOs are able to provide functions similar to a traditional staff augmentation that can be deployed to assist as an interim solution during periods of transition within IT leadership—for short-term or long-term. No matter the size your business or current technology infrastructure, having a seasoned advocate in your corner allows you to focus on the future of your organization. Robert Half Technology. 2018 Salary Guide for Technology Professionals. 2017.